For Collecting Dust & Debris such as Wood, Plastics, Fiberglass & Body Filler. Conductive Stainless Steel Canister, for Dry Vacuuming Only. Powerful industrial vacuum for commercial use, particularly where use of electric equipment is hazardous or where electric supply is not available. Connect and operate two tools simultaneously. 10 gallon (38 liter) capacity; developed to be safe and portable. 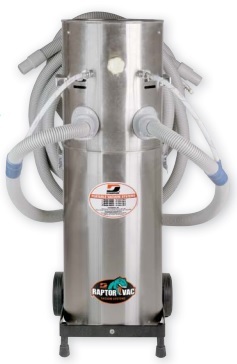 Top of the vacuum head is designed to work as a shelf to hold air tools, abrasives, etc. 100 CFM (2,830 L/Min) vacuum flow. The filter element is water resistant and washable. Also accepts optional 64630 HEPA Filter. USA Government National Stock Number 7910015614879. Same as above, and also includes two 64639 Conductive Coaxial Hose Assemblies.